There were 417 races run on the flat in North America May 3, but only one captured the attention of the public. Normally that attention would be in celebration of the Kentucky Derby Presented by Yum! Brands (gr. I) winner, but this year the attention came in the form of criticism due to the tragic catastrophic breakdown suffered by second-place finisher Eight Belles. The industry has been forced to defend itself in the wake of this criticism, mostly from those outside the sport, many with limited knowledge of Thoroughbred breeding and racing. Criticism, constructive or otherwise, comes in many forms. There is little need to pay serious attention to radical groups calling for the immediate end to Thoroughbred racing, a multi-billion-dollar agribusiness that employs hundreds of thousands. But it is important to listen to those who suggest the industry should closely examine itself and discuss ways to make the sport safer. Similarly, when a driver dies in car racing, or a fighter in boxing, those sports owe it to their participants and fans to examine the reasons why the accident occurred and see if significant changes can be made to diminish the odds of further injuries. That, however, is where the similarities end between horse racing and other sports. When a pro football player breaks his leg, the bone is set and the leg is placed in a cast. No one calls for the sport to be banned. But because of the musculoskeletal system of the horse, too often the injured limbs cannot be repaired, and, as in the case of Eight Belles, unfortunately require euthanasia instead. Those placing blame on the racing surface, owner Rick Porter, trainer Larry Jones, and/or jockey Gabriel Saez are way off base. Likewise, those who question running a filly against colts should watch a tape of last year’s Belmont Stakes (gr. I); a single protest cannot be recalled after Rags to Riches’ victory. Since the moment Eight Belles fell after fracturing both ankles while galloping out after the Derby, Thoroughbred industry officials have been busy spinning the news of the heartbreaking accident on racing's greatest stage. Blue ribbon panels have been put together to look at racing’s important issues and pre­sent reports to industry stakeholders. More than likely, the issues that will be discussed will not be new topics. For years, industry groups have been studying such things as racing surfaces, medication, soundness, and durability. 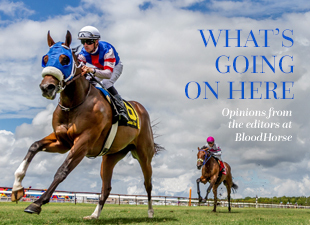 Perhaps, however, with the industry now under a microscope—from the press, the public, and possibly federal regulators—owners, breeders, trainers, jockeys, veterinarians, and researchers will debate the issues with more urgency. • Woodbine, race 8, Sargeant Silver, broke down, vanned off. Network television cameras were not pointed at the other horses that broke down May 3, but they are no less important than Eight Belles. Although horses were breaking bones long before man ever thought about racing them against each other, they are breaking down all too often. It should be the goal of everyone connected to the industry to help figure out why, and bring about meaningful change to make the sport safer for every Thoroughbred.